According to the 2013 Shell Lens Scenarios, which tries to predict what the world’s energy dependence could look like in 2100, by 2070 we could be living oil free. Shell lumps electric and hydrogen into the same group, which they project will have a 60% market share by 2060. Shell has a vested interest in pushing the hydrogen barrow as they and Total are currently the only two major oil companies that have stated they are actively developing hydrogen based fueling technology for vehicles. The rest of the oil industry does not seem to share Shell's opinion. BP predicted in Feb 2012 that electric vehicles and plug-in hybrids, will make up only 4 percent of the global fleet by 2030 while Exxon said electric vehicles, plug-in hybrids and vehicles that run on natural gas would make up only 5 percent of the fleet by 2040. Let's hope big oil are only trying to fool themselves with these predictions. 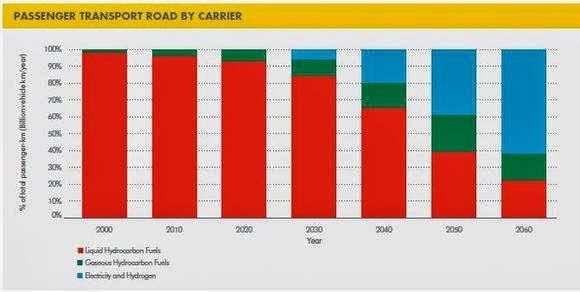 In the chart below Shell don't see EV's reaching 10% market share until approx 2035, over two and a half decades after the first mass produced EVs were launched, yet some markets are approaching 10% now. If market trends in Norway, the third largest oil exporting nation in the world, are an accurate leading indicator, fully-fledged electric cars have already captured a market share of 9.1 per cent, so even Shell's time scale looks very conservative.